When organisms such as algae become a problem in private or commercial fish ponds, copper sulfate treatment provides an inexpensive solution. However, improper application of copper sulfate can create more problems than it solves. Poisonous to Fish: Excessive application of copper sulfate will kill fish, especially if water is low in alkalinity. If a pond contains less that 50 milligrams of alkaline material per liter, a pond should not be treated with copper sulfate, according to the University of Kentucky College of Agriculture. 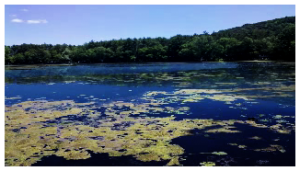 If copper sulfate kills a thick mat of algae at once, the decaying vegetation may deprive the pond of oxygen. For dense algal blooms, it is better to apply copper sulfate to the worst spots instead of giving the pond a complete copper sulfate treatment. OR DON’T USE IT PERIOD! In a pond with algae, copper treatments can cause oxygen concentrations to drop, which may result in fish kills. Pond algae is a major source of oxygen production and by removing it this source of oxygen is also removed. In addition, oxygen will be consumed as the algae decomposes. If you are treating to kill algae, either treat in a series of smaller doses over time or have emergency aeration available. Copper is also toxic to invertebrates, such as snails, and also most of the zooplankton in a pond (daphnia, rotifers, etc. ), so if you are relying on the zooplankton as a food source (i.e. fry ponds), you may not want to use copper. Overuse of this product is common due to its short-term effectiveness. This can result in copper build-up in the sediments leading to a sterile bottom. A sterile bottom will lead to a lack of beneficial bacteria and cause among other things, high algae blooms which in effect, reduces the chances for aquatic plants to grow due to the shading on the bottom caused from the thick algae. When aquatic plant growth diminishes, so can fish growth and survival. Copper sulfate not safe, can be toxic to fish and other organisms. We recommend the use of our all-natural beneficial bacteria product, Bio Lake Clear and Ecosocks GC to treat ponds and lakes for algae control and faster organic matter decomposition from silt, sludge and decaying plants & fish.